Hey, I've got one of those. Very heavy, but a really, really good prop. You can't really tell from the pics on the eBay pictures, but the clip on the side even has some blue painted on there, so it looks like you have a full clip of ammo, like in the game. Here ya go. They're pretty sweet looking. Very, very awesome. Paint that black and you've got yourself an crazy cool Storm Commando costume. But...size 8 boots and an XL flight suit? Who can wear this thing? Oh WOW!!! Sadriel that is an awesome clone collection!! 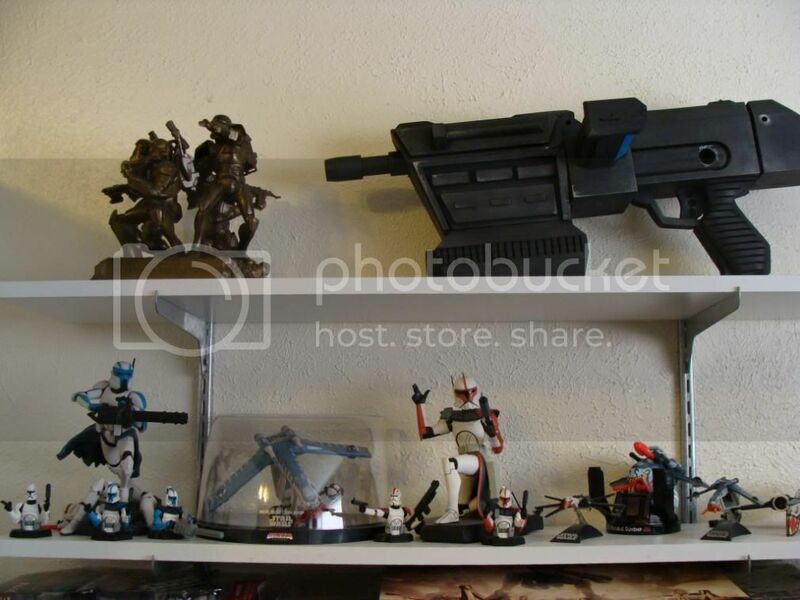 That Republic Commando group statue is brilliant & pretty rare !! Wait a second...is that made out of plastic? They dont even say so. ... damn it i need money. Make way for the Dark Lord of they Sith! What SW fan's house is complete without this thing! It says the current bid for that is 99 cents....yikes! wow, that is excellently done.